how to calculate the surface area of a cuboid. how to solve word problems about cuboids. how to use the net of a cuboid to calculate the surface area. A cuboid is a 3-dimensional object with six rectangular faces. All its angles are right angles and opposite faces are equal. A cuboid is also called a rectangular prism or a rectangular solid. In a cuboid, the length, width and height may be of different lengths. A cube is a special case of a cuboid in which all six faces are squares. To calculate the surface area of the cuboid we need to first calculate the area of each face and the add up all the areas to get the total surface area. Find the surface area of the following cuboid. How to derive the formula of the surface area of a cuboid? How to find the surface area of a cuboid? How to solve problems about the volume and surface area of a cuboid? On Southwest Airlines, the maximum size of a carryon bag is a length of 24 in., a width of 10 in., and a height of 16 in. How much can be packed in this maximum sized bag? A seamstress needs to cover a box that is 8 cm long, 5 cm high and 4 cm wide with material on all sides. How much material does she need? 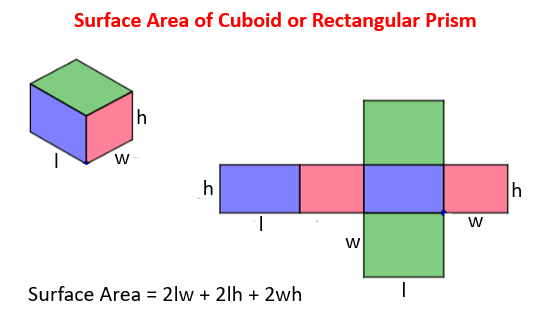 How to compare the surface area of a cube and a cuboid? Another way to look at the surface area of a cuboid is to consider a net of the cuboid. The net is a 2-dimensional figure that can be folded to form a 3-dimensional object. Imagine making cuts along some edges of a cuboid and opening it up to form a plane figure. The plane figure is called the net of the cuboid. The following net can be folded along the dotted lines to form the cuboid. We can then calculate the area of each rectangle in the net and add them up to get the surface area of the cuboid.